Want to keep your telemetry for longer than the standard retention period? Or process it in some specialized way? Continuous Export is ideal for this. The events you see in the Application Insights portal can be exported to storage in Microsoft Azure in JSON format. From there you can download your data and write whatever code you need to process it. The Export button at the top of a metrics or search blade lets you transfer tables and charts to an Excel spreadsheet. Analytics provides a powerful query language for telemetry. It can also export results. If you're looking to explore your data in Power BI, you can do that without using Continuous Export. The Data access REST API lets you access your telemetry programmatically. You can also access setup continuous export via Powershell. After Continuous Export copies your data to storage (where it can stay for as long as you like), it's still available in Application Insights for the usual retention period. Use of VNET/Azure Storage firewalls in conjunction with Azure Blob storage. Immutable storage for Azure Blob storage. Azure Data Lake Storage Gen2. Choose the telemetry data types you want to export. 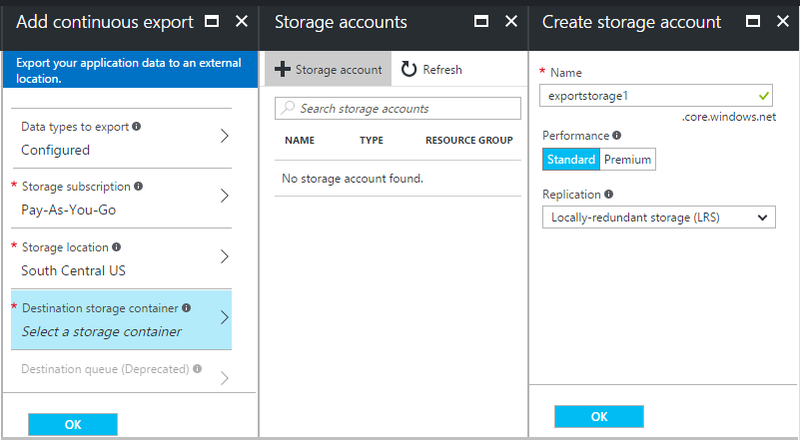 Create or select an Azure storage account where you want to store the data. For more information on storage pricing options visit the official pricing page. By default, the storage location will be set to the same geographical region as your Application Insights resource. If you store in a different region, you may incur transfer charges. Once you've created your export, it starts going. You only get data that arrives after you create the export. There can be a delay of about an hour before data appears in the storage. To stop the export, click Disable. When you click Enable again, the export will restart with new data. You won't get the data that arrived in the portal while export was disabled. To stop the export permanently, delete it. Doing so doesn't delete your data from storage. Can't add or change an export? To add or change exports, you need Owner, Contributor or Application Insights Contributor access rights. Learn about roles. What events do you get? The exported data is the raw telemetry we receive from your application, except that we add location data which we calculate from the client IP address. Data that has been discarded by sampling is not included in the exported data. Other calculated metrics are not included. For example, we don't export average CPU utilization, but we do export the raw telemetry from which the average is computed. The data also includes the results of any availability web tests that you have set up. Sampling. If your application sends a lot of data, the sampling feature may operate and send only a fraction of the generated telemetry. Learn more about sampling. You can inspect the storage directly in the portal. Click Browse, select your storage account, and then open Containers. The date and time are UTC and are when the telemetry was deposited in the store - not the time it was generated. So if you write code to download the data, it can move linearly through the data. Each blob is a text file that contains multiple '\n'-separated rows. It contains the telemetry processed over a time period of roughly half a minute. Each row represents a telemetry data point such as a request or page view. Detailed data model reference for the property types and values. For a larger code sample, see using a worker role. If you change the key to your storage, continuous export will stop working. You'll see a notification in your Azure account. Open the Continuous Export blade and edit your export. Edit the Export Destination, but just leave the same storage selected. Click OK to confirm. The continuous export will restart. On larger scales, consider HDInsight - Hadoop clusters in the cloud. HDInsight provides a variety of technologies for managing and analyzing big data, and you could use it to process data that has been exported from Application Insights. But all I want is a one-time download of a chart. Yes, you can do that. At the top of the blade, click Export Data. I set up an export, but there's no data in my store. 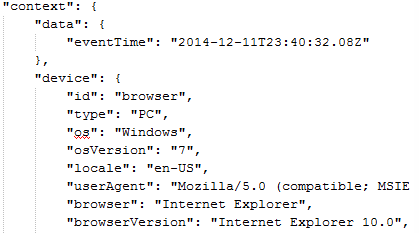 Did Application Insights receive any telemetry from your app since you set up the export? You'll only receive new data. If the account is owned by your organization, you have to be a member of the owners or contributors groups. Can I export straight to my own on-premises store? No, sorry. Our export engine currently only works with Azure storage at this time. Is there any limit to the amount of data you put in my store? No. We'll keep pushing data in until you delete the export. We'll stop if we hit the outer limits for blob storage, but that's pretty huge. It's up to you to control how much storage you use. How many blobs should I see in the storage? For every data type you selected to export, a new blob is created every minute (if data is available). In addition, for applications with high traffic, additional partition units are allocated. In this case, each unit creates a blob every minute. I regenerated the key to my storage or changed the name of the container, and now the export doesn't work. Edit the export and open the export destination blade. Leave the same storage selected as before, and click OK to confirm. Export will restart. If the change was within the past few days, you won't lose data. Can I pause the export?